Svelte Hotel & Personal Suites accentuate the stay experience by making it more personalized with an innovative “in-room cook and dine” concept. 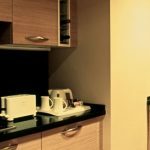 All the suites feature a scrupulous and modular kitchenette with all the essential and modern amenities like a refrigerator, microwave oven, hot plate, cookware and service ware. These enable you to become your own chef, prepare the choicest of dishes at your convenience, and enjoy the privacy of in-room dining.